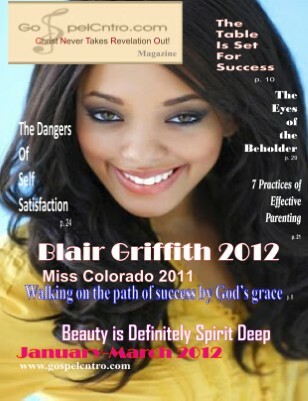 Blair Adair-Griffith the former Ms. Colorado wore the crown in the year of 2011. She shares her story of struggle and blessing. The blessings of God are not measured by what man deems as success. Where can beauty be found? What is beauty? The world is inundated with measures and dictates about the subject which greatly influence our perspectives. Hear what a world defined beauty has to say about it. Gary Coleman the latest Gospel Rap sensation New CD is released! Cenece Dixon & GospelCNTRO Ministries present Repentance B4 Revival: Soak the Altar Leadership Summit Jan. 15-21, 2012 hosted by the Absolute Word Church, Pastor Lily Richardson Attend the Live CD Recording coming March 24, 2012 and much more..